In the years preceding the 2011 and 2013 revolutions, there was a prevailing idea in Egypt’s foreign policy-making circles that there was a direct correlation between foreign policy and national security. While the symbiotic relationship between foreign policy and national security was a widely accepted notion, few had made the effort to explain the reasons for their connection. Nevertheless, some foreign policy issues were left to national security agencies, and among these was the Palestinian cause handled by the general intelligence agencies. The changes that Egypt experienced in the 2011 and 2013 revolutions played a role in the academic and political re-exploration of this relationship, and such topics became more freely discussed. As a result, it has been found that there are multi-dimensional components in Egyptian foreign policy, as seem during the first term in office of President Abdel-Fattah Al-Sisi. This article analyses three dimensions of the security component of Egyptian foreign policy, which have all come about as a result of the institutionalisation of foreign policy decision-making processes. This institutionalisation has come through the National Defence Council, the National Security Council, and the Council for Combating Terrorism and Extremism. The article will also demonstrate the growing importance of military force as one of the tools for implementing Egypt’s foreign policy and how this has affected its relationship with the international community. Finally, it will attempt to explore how issues of terrorism and extremism have become top priorities in Egypt’s action in regional and international forums. During the first term of Al-Sisi’s presidency, there has been an increase in security institution involvement in foreign policy decision-making in Egypt. This has been especially true in relation to issues pertaining to national security and more importantly issues that need the use of military force. Article 203 of the 2014 constitution highlights the formation of a National Defence Council that has the president as its head and includes as members the prime minister, MPs, the interior minister, the foreign minister, the finance minister, the defence minister, the head of General Intelligence, and the chief of General Staff, as well as other ministers and cabinet members. In accordance with the law, this council is in charge of ensuring the security of the state and identifying its political and military objectives. It must also ensure that such objectives are aligned with other government policies, especially those pertaining to foreign policy. The constitution also states that when parliament is in recess, the National Defence Council is in charge of declaring war on another state or non-state actor, thereby sending military force beyond Egypt’s borders. This is what happened in March 2015, when in the absence of the parliament, the council made the decision to send the military to participate in Operation Decisive Storm in Yemen. Article 205 of the constitution also provides information on the formation of the National Security Council. This is also headed by the president, and its members include the prime minister, the majority leader in parliament, the interior minister, the defence minister, the foreign minister and others. The role of the council is to draw up policies that ensure national security, determine and locate both internal and external threats to it, and finally take all necessary actions to face up to official or public threats to national security. 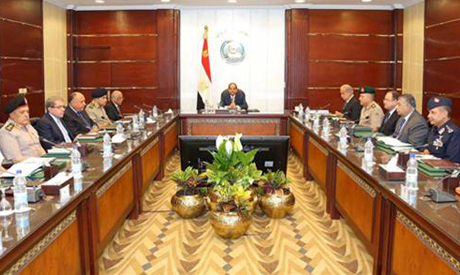 President Al-Sisi has also taken the initiative of appointing two experts in national security as consultants. One of them is Faiza Abul-Naga, who has become his consultant on national security, and the other is Ahmed Gamaleddin, appointed as consultant on counter-terrorism. In June 2017, President Al-Sisi decided to establish another council called the National Council for Combating Terrorism and Extremism. The members of this include the grand imam of Al-Azhar, the patriarch of the Coptic Church, the defence minister, the interior minister and others. It also includes 13 members of the public. The roles of the council include demonstrating the state’s counter-terrorism strategy to the international community, examining legislative decisions in countering terrorism internally and externally, pursuing the establishment of a special security entity between Egypt and the Arab states, and cooperating with these states to put an end to organised crime in the region. The council also works to inform the international community of the presence of terrorist organisations within Egypt and the fact that there are states and authorities that support terrorists bent on attacking the Egyptian public. The council also works to take legal action against states that sponsor terrorists against Egypt. We are living in an era in which the Armed Forces has been playing an increasingly vital role in foreign policy. The reasons behind the increasing “militarisation” of foreign policy are two-fold, and include, first, the evident factor that Egypt currently lacks the economic tools needed to pursue “quiet diplomacy” based on soft power since this primarily relies on economic power. The second factor is that President Al-Sisi has maintained a healthy relationship with the military even after his becoming president in 2014. The president has worked to develop Egypt’s military strength through improved training and increased weaponry. Based on the international Global Firepower rankings, these efforts have resulted in Egypt’s moving from 11th largest military power in the world in 2016 to 10th largest in 2017. The increase in the military’s role in foreign policy has been reflected in the president’s speeches, in which he has insisted on the need to send Egyptian military forces to help protect any Arab state facing real security threats. Sending military forces to help other countries can also be a way for Egypt to protect its own national security and people. For instance, after a video showing Islamic State (IS) group militants in Libya beheading 21 Egyptian Copts, the state did not hesitate to send the air force to attack IS bases in Libya in 2015. While Egypt has not participated in the Saudi-led coalition in Yemen, it has provided naval security for the Bab Al-Mandab Straits, since this relates to the security of Suez. Furthermore, Egypt has been taking part in many military exercises with various states both within the Middle East and around the world. From 2014 to 2017, Egypt has been an avid participant in exercises with Saudi Arabia, the UAE, Bahrain and Kuwait. In May 2015, Egyptian and Russian naval forces participated in a military exercise in Alexandria, and in October 2017 Egypt and Greece took part in the “Medusa 5” military exercise that took place in Rhodes. During President Al-Sisi’s first term in office, the issue of terrorism has topped Egyptian priorities in international forums. The president and the Egyptian delegations participating in these forums have made speeches on this topic, among them Al-Sisi’s address to the United Nations last September in which he discussed Egypt’s position of encouraging the international community to cooperate in fighting terrorist organisations as well as the states that politically or logistically support them. In Spain in 2015 the president made a speech in which he said that the world more than ever needed a coalition of people and cultures to counter extremism and prejudice because both these elements were breeding grounds for terrorists threatening human civilisation. The years 2016 and 2017 were critical for Egypt since the country was both a non-permanent member of the UN Security Council and the head of its committee for combating terrorism. During that time, Egypt stressed the importance of the Security Council’s enacting new policies to stop terrorists from gaining weapons and addressing the phenomenon of foreign fighters joining such groups. Egypt also emphasised the importance of getting the international community and social media companies on board with such policies. Egypt has carried out many actions against fighting global terror, such as training airport staff in many airports around Africa on how to detect explosives and weapons being smuggled into planes. It is for such reasons that Egypt should now reposition itself as a leading power in the region, not only because of its vast size and important history, but also because of the strength of its military that has long enabled it to be a major player in the Middle East and North Africa. If Egypt continues on this path during Al-Sisi’s expected second term in office, then there will be many positive outcomes, such as Egypt’s becoming a major regional partner steering the region to a safer and more secure future. However, there are also challenges on this path, among them the possibility that the sphere of what is considered a security issue will be widened at the expense of what are considered political issues. It is for such reasons that the state must find a balance between militarism and diplomacy and find alternative means to fight against terrorism. Using military action along with these alternative methods will ensure the stability of the Egyptian political arena. The writer is an expert on security at the Al-Ahram Centre for Political and Security Studies.